Ottawa (May 24)  During yesterday's Canada-Russia Parliamentary Friendship Group luncheon meeting with visiting Russian Deputy Foreign Minister Sergei Kislyak and Russian Ambassador to Canada Georgiy Mamedov, Liberal M.P. Borys Wrzesnewskyj challenged the Deputy Foreign Minster on a number of fronts related to Russian foreign policy. Near the conclusion of the luncheon, Wrzesnewskyj expressed concerns about Russia's foreign policy and methods of international engagement citing the following three examples. 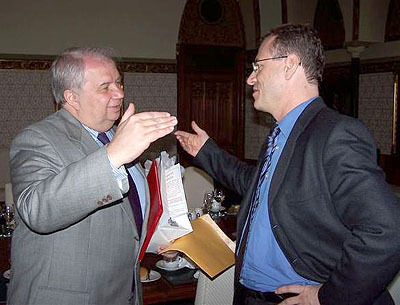 Photo: Russian Deputy Foreign Minister Sergei Kislyak (left) and M.P. Borys Wrzesnewskyj, M.P. (right) agreed on one issue, that a more fulsome meeting to discuss international engagements would be called for. The first issue raised by Wrzesnewskyj was the deteriorating relations between Estonia and the Russian Federation. In raising this important issue on behalf of Canadians of Estonian ancestry and those with ancestry from the Baltic region, Wrzesnewskyj was surprised by the Deputy Foreign Minister's reaction, who characterized Estonians as harbouring Nazi nostalgia. Incredulously, the Deputy Foreign Minister went on to suggest that Estonians were trying to create false propaganda by saying that the Soviets, who according to him solely freed Estonia from the grip of the Nazis, were somehow occupiers. In his second issue, Wrzesnewskyj raised Russia's ongoing nurturing of Iran's nuclear program. Russian Deputy Foreign Minister Kislyak underscored that he was personally involved in Iran's nuclear program. As well, he even seemed to indicate that American President George Bush supported Russia and that it was playing a positive role in the region by providing nuclear energy technology to Iran. This rosy assessment contrasts sharply with a report issued yesterday by the International Atomic Energy Organization which states that the Iranian regime defied several UN Security Council Resolutions calling for the immediate suspension of its uranium enrichment program, and that it has started up and expanded its efforts to enrich uranium on a much larger scale. The final issue raised by Wrzesnewskyj was Russia's continuing use of gas supply as a tool of international politics against its neighbours, particularly Ukraine. Unfortunately, because the Deputy Foreign Minister had a flight to catch, he did not speak to this issue. However, the Deputy Foreign Minister welcomed Mr. Wrzesnewskyj to meet with him in Moscow. Later, Wrzesnewskyj stated: "Canada's 'New Government' has had at least a dozen high level ministerial meetings with Russia during which our countries signed a number of agreements. In a period during which Canada's 'New Government' and Russia, as Arctic neighbours, are looking to cooperate their economic relations in regards to natural resource supplies to the world, we must not sell out our concerns for democratic progress within Russia. More importantly, we must not fear to fulsomely address the bearish international behaviour of Mr. Putin's regime."